Can we eat to starve cancer (By : William Li) ? Why you should listen to him ? Many of society’s most devastating diseases -- cancer, cardiovascular disease, diabetes and Alzheimer’s, to name a few -- share a common denominator: faulty angiogenesis, the body’s growth of new capillary blood vessels. Given excessive or insufficient blood vessel growth, serious health issues arise. While researching under Harvard surgeon Judah Folkman, who pioneered the study of angiogenesis, Li learned how angiogenesis-based medicine helps patients overcome numerous diseases by restoring the balance of blood-vessel growth. Li co-founded the Angiogenesis Foundation in 1994. The foundation’s Project ENABLE -- a global system that integrates patients, medical experts and healthcare professionals -- democratizes the spread and implementation of knowledge about angiogenesis-based medicines, diet and lifestyle. Some 40,000 physicians have been educated on new treatments, ranging from cancer care to wound care, by the foundation’s faculty of medical experts, and they are bringing new, lifesaving and disease-preventing techniques to people around the world. Why is Eggs no longer a forbidden food ? Remember the days when you could enjoy your eggs sunny side up or in a nice fluffy omelet without worrying about your heart and nasty gobs of cholesterol clogging your arteries ? What happened to those days ? It all starts back in the early 70’s when leisure suits and wood paneling were in fashion… it’s also when the whole connection between cholesterol and heart health all began. 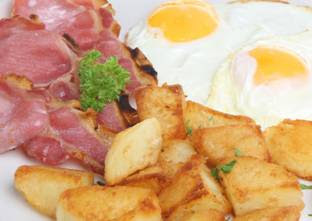 Sometime around 1972, the American Heart Association issued a report that stated that you should limit the amount of eggs you eat so you can reduce cholesterol intake. All of a sudden…practically overnight… the poor little egg got a bad rap and became labeled the “forbidden food” of our time. As a result, for years we were told by so-called “health experts” that we should eat no more than three per week or any at all ! The egg became Public Enemy especially those evil little yolks…they were the “brains” behind the egg’s artery invasion. So then the egg white omelet was born. These “experts” thought that because eggs have cholesterol in them (especially in those nasty little yolks) so common sense says that they must raise cholesterol levels in our blood. But studies now show that this theory is seriously flawed. For example, the Framingham Heart Study found that egg consumption was unrelated to blood cholesterol levels or heart conditions and that includes the yolks. In another 14-year study… 117,000 nurses and health professionals found that there was no difference in the risk for coronary heart problems between those who ate less than one egg per week and those who ate more than one egg per day. So forget what you used to hear about our buddy the egg… because once you set aside the “Egg Myth”… you’ll see just how healthy and nutritious they really are. 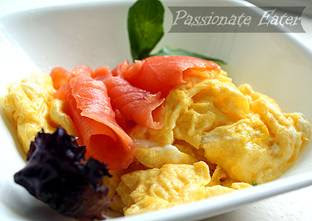 Eggs are a great source of protein, providing 5.5 grams of protein per egg and only about 70 calories. They are also the most complete source of protein…that means they have all the nine essential amino acids that your body needs… and amino acids are the “building blocks” of muscle and other tissues in the body! 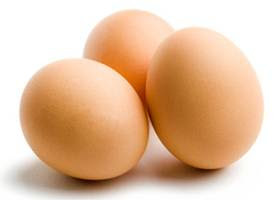 Eggs are also chock-full of vitamins, such as: A, B, C, D, E and K; as well as minerals (iron, zinc, selenium), as well as antioxidants lutein and zeaxanthin. Lutein and zeaxanthin, two antioxidants found in egg yolks, help prevent age-related eye problems. Even better research shows that the lutein from eggs is more easily absorbable by your body than lutein from other food sources. 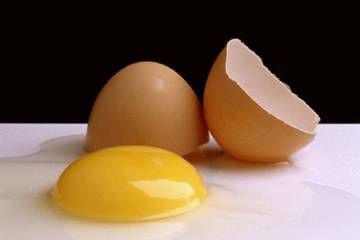 Egg yolks are the richest source of choline, a member of the vitamin B family, you can get. It supports your brain and nervous system function by maintaining the structure of brain cells, and is a key component of the neuro-transmitter acetylcholine that helps relay messages from the brain and through nerves to the muscles. Choline is also an essential nutrient that contributes to fetal brain development. Two eggs provide about 250 milligrams of choline, or about half of the recommended daily intake for pregnant or breastfeeding women. Since choline is one of the B vitamins (including B-12), it works as a powerful antioxidant, converting homocysteine…. a substance that can cause damage to your blood vessels…into harmless molecules. The high-quality protein in eggs helps keep you feeling fuller longer. In fact, during research people reported feeling less hungry and reduced their caloric intake after eating eggs. Research shows that high-quality protein like=20 eggs can help active adults build muscle strength and help prevent muscle loss…and other studies show that choline found in eggs may even help prevent muscle damage. Ordinarily vitamin D is produced by your skin in response to exposure to sunlight. But eggs are one of the few foods that offer vitamin D radiation free. Vitamin D’s main job is to strengthen your bones by raising calcium absorption. It also helps boost your immune system, regulate your blood pressure, and regulate cell growth. 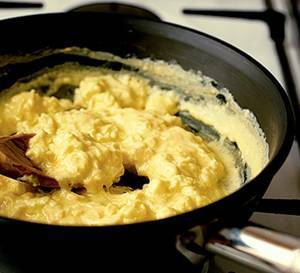 So you see, those days of enjoying eggs are not gone at all. So don’t be afraid to crack open some incredible edibles ! Not all eggs are the same. You might want to try organic, free-range eggs. Yes… they are a little more expensive…but these eggs that come from cage free chickens tend to produce eggs that are higher in protein and vitamins. And with organic you can rest assured that harmful hormones don’t end up in your morning omelet. Two reasons that make the extra money worth it ! Here are also some tips for maintaining the freshness of your eggs.
. Store them in the refrigerator where they can stay up to a month. • Don’t wash them because it can remove the protective coating on them. • Keep them in the original carton or a covered container so they don’t absorb the odors in your fridge or lose any of their moisture. • I know many people like to store them on the fridge door, but that’s not a good idea. Each time the door is opened and closed the eggs are exposed to too much heat. Keep them on the shelve in a covered container. 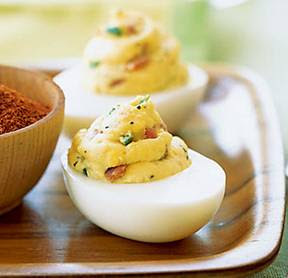 • Store them with their pointed edge facing downward to prevent the air chamber and the yolk from shifting. What is Lily of The Valley ? View all these pictures below and appreciate their beauty. This flower is known as Lily of The Valley and is especially associated with the Month of May. Lily of the Valley is a flowering plant popular in gardens for its appearance and its delicate scent. A perennial plant with a rhizome root system, Lily of the Valley sends up shoots in spring and can grow up to 12 inches (30 cm) tall. Each Lily of the Valley stem has two leaves and a flower stalk featuring white, bell-like blossoms that develop into tiny red berries. Lily of the Valley is native to temperate areas of Asia, Europe, and North America, where it grows naturally in woodland settings. Lily of the Valley is not difficult to grow, but the soil must be prepared a few weeks ahead of time. Choose an area with rich, moist soil, and in early September, stir the soil to a depth of 15 inches (38 cm), then add manure two or three weeks later. At the end of September, the Lily of the Valley crowns should be planted six inches (about 15 cm) apart, fairly deep, and preferably interspersed with leaf mold. If planting more than one row, the rows should be at least nine inches (23 cm) apart. Lily of the Valley beds also require transplanting every three or four years. 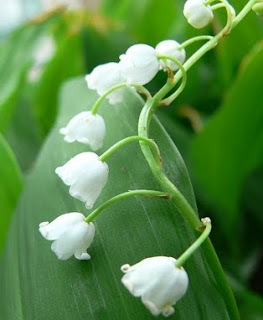 There are a number of traditions and legends regarding the Lily of the Valley. One story tells that the flowers first grew during Saint Leonard's battle with a dragon; everywhere his blood spilled on the ground, a Lily of the Valley plant sprang up. 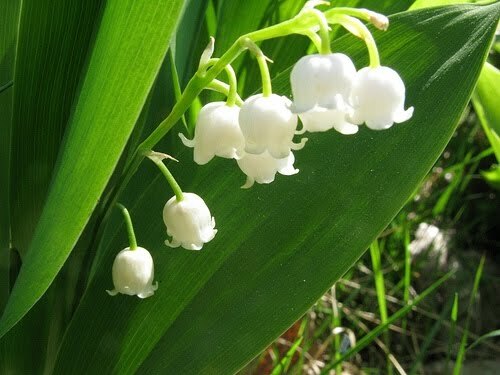 Others refer to Lily of the Valley as "Our Lady's Tears" and tell that the flowers first bloomed where Mary's tears hit the ground at the foot of the Cross. Lily of the Valley is also associated with the month of May - the second part of its Latin name, Convallaria majalis, means "belonging to May" - and is typically sold on May Day in France. 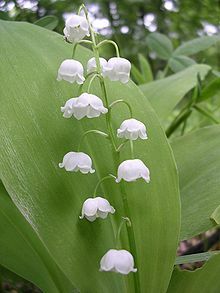 Lily of the Valley is also the national flower of Finland. 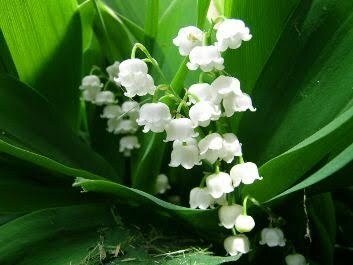 In the language of flowers, Lily of the Valley symbolizes purity, humility, and a return to happiness. Its growth in the spring is said to herald the nightingale's yearly return to the forest and its mating season. Lily of the Valley traditionally has a number of medicinal applications, though the plant is also poisonous, particularly to children and pets. The plant has been used to treat cardiac and urinary tract disorders, as well as skin irritations. A syringoma is a type of benign skin tumor which originates in the sweat glands. The term “syringoma,” derived from a Latin root meaning “tube,” is a reference to the tube-like structure of the sweat gland where the tumor starts to grow. These benign neoplasms are most commonly treated when they become an aesthetic problem, or when a doctor wants to confirm that the growth actually is benign, removing it for biopsy on the grounds that it is better to be safe than sorry when it comes to abnormal skin growth. Syringomas are most commonly seen around the eyelids and upper cheeks, although they can occur in other regions of the body as well. 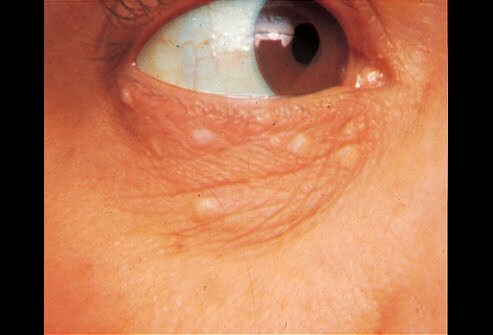 They look like small lumps inserted under the skin, and sometimes appear in eruptive form, in which several syringomas emerge at once, scattered across the skin. These growths are sometimes confused with xanthomas, collections of cholesterol under the skin which also have a characteristic lumpy appearance. A doctor can often diagnose a syringoma with a physical examination and interview of the patient to learn more about when the growth first appeared and whether or not it is painful. However, some doctors may ask if they can take a sample to biopsy, so that a pathologist can examine some cells from the growth to see if they have any characteristics which might lead a doctor to conclude that the growth is something other than a syringoma. In this case, the biopsy can be done quickly in the doctor's office. These growths are usually not painful. Some patients may pick at them, creating a scabbed area which can be itchy or painful, and sometimes syringomas make it difficult to apply makeup. They can also attract unwanted attention, especially in the case of eruptive growths, which are harder to miss than a single small syringoma which may not be visible until someone is very close to the patient and can clearly see the patient's skin. There are treatment options available to remove syringomas, for patients who would like the growths removed. These options include lasering or cutting to remove the growth. However, patients should be aware that these methods can leave scarring, and that the growth can sometimes recur. Most people think that alcohol is fairly harmless and just something to be enjoyed. Other than a few ill-effects the next day and maybe putting on a bit of extra weight, alcohol does not seem to have any long lasting effects. But alcohol can cause harm. It is a mistake to think that you have to be a heavy drinker to run into problems. Although it can take as long as 10 to 20 years, drinking just a bit more than you should over time can seriously harm your liver. Not feeling any side effects from drinking does not mean that you are not risking chronic ill-health or lasting liver damage from alcohol-related liver disease. Vast numbers of us now fall into this category. The liver is your largest internal organ. Among hundreds of jobs, it has to deal with the alcohol you drink. If you’re drinking too much, your liver has to literally soak up the punishment. With so few nerve endings to signal pain you won’t know that your liver is complaining. If you’re drinking a lot on a regular basis, chances are that you will not feel anything happening until your liver has had enough. The harm to your liver at this stage will be severe – and could even be fatal. This is not an attempt to put you off drinking. Being more sensible about how you drink is the aim. It can be easy to underestimate how much alcohol you are drinking and often difficult to stop after a certain number of drinks. A little more knowledge about alcohol itself will help. Taking a few minutes to read this leaflet to help you understand the effect alcohol has on you and your liver is a big step in the right direction. This information is written to signpost the ways to safer drinking. It gives you short and long-term odds on the things that will go wrong if you ignore them. The message is simple: when you raise a glass, spare your liver a thought. 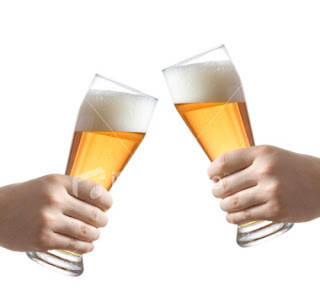 If you keep track of how much you drink, you should stay in better shape and around for longer to enjoy it. Jim is 55 years old. He used to visit his local pub most days to meet up with his mates. He had two to three pints at lunch and a couple of drinks in the evening (roughly 60 units of alcohol a week). Recently, over the course of a few weeks he noticed his abdomen had become swollen and tight. After tests, it was discovered that this was due to the build up of fluid (ascites), caused by cirrhosis of the liver. Jim took his doctor’s advice and has stopped drinking completely. After six months the fluid has gone and he is now feeling well and fitter, even though his liver will never fully recover. If he had continued drinking even a small amount, things could have been worse. Half of people with ascites die within two years of diagnosis. What happens when you drink alcohol ? What happens to the liver if you drink too much ? When the liver breaks down alcohol, it stores the fat in your liver. There should be little or no fat in a healthy liver. Too much of this fat can build up if you drink more than the liver can cope with, leading to fatty liver disease. You can get a fatty liver without drinking. This is called, perhaps unoriginally, ‘non-alcoholic fatty liver disease’ (NAFLD). It is thought that if you are overweight and drinking too much, you will be increasing the chances of damaging your liver, as it receives fat from both food and alcohol. Fatty livers return to normal if you drink within the sensible limit. If you carry on drinking above that limit you are running the risk of more serious damage. If you have a fatty liver and continue to drink, you have up to a one in three chance of getting alcoholic hepatitis. This is a condition where your liver becomes puffy, swollen and tender. It can affect you suddenly – after a weekend of binge drinking, for example – and if your liver fails, it can kill you. Alcoholic hepatitis can happen to you at an early stage or after many years of excessive drinking. Scar tissue, which is generated to protect injured tissue from further damage and will disappear in a healthy liver, may keep building up. This scarring is known as fibrosis. The final stage of alcoholic liver disease is cirrhosis. This is usually the result of long-term, continuous damage to the liver. Irregular bumps, known as nodules, replace the smooth liver tissue and the liver becomes harder. The effect of this, together with continued scarring from fibrosis, means that the liver will run out of healthy cells to support normal functions. This can lead to complete liver failure. By the time you discover you have cirrhosis your quality of life may be severely damaged as your liver will have stopped working efficiently. If you carry on drinking at this stage you will speed up the damage to your liver and rapidly increase your chances of dying. 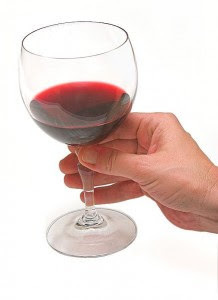 The odds are one in ten that you will develop cirrhosis if you drink too much over a long period of time. In the UK, the number of people dying from cirrhosis each year is increasing. As well as all the problems related to the liver not doing its job, people with cirrhosis also have a much higher chance of getting liver cancer. Each year, three to five per cent of people with cirrhosis will develop liver cancer. Henry is 35. He started drinking heavily with the Rugby Club at University and continued to see his friends at the pub where he drank up to five pints of strong lager three times a week (45 units of alcohol a week). Henry went on a ‘bender’ with friends abroad, drinking day and night for nearly a week. Afterwards he didn’t feel good and his friends noticed he looked a bit yellow. Henry’s doctor admitted him to hospital at once where he was treated for severe alcoholic hepatitis. Despite attempts to save him, Henry was among the one in 10 people who die despite treatment. What Is a Blood and Marrow Stem Cell Transplant and WHY ? A blood and marrow stem cell transplant replaces a person's abnormal stem cells with healthy ones from another person (a donor). This procedure allows the recipient to get new stem cells that work properly. Small numbers of stem cells also are found in the blood and in the umbilical cord (the cord that connects a fetus to its mother's placenta). Another type of stem cell, called an embryonic stem cell, can develop into any type of cell in the body. These cells aren't found in bone marrow. * Certain cancers, such as leukemia. The high doses of chemotherapy and radiation used to treat some cancers can severely damage or destroy bone marrow. A transplant replaces the stem cells that the treatment destroyed. * Severe blood diseases, such as thalassemias, aplastic anemia, and sickle cell anemia. In these diseases, the body doesn't make enough red blood cells or they don't work properly. * Certain immune-deficiency diseases that prevent the body from making some kinds of white blood cells. Without these cells, a person can develop life-threatening infections. A transplant provides stem cells to replace the missing white blood cells. 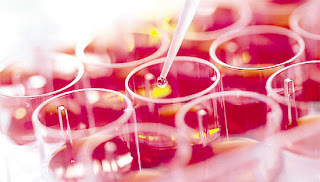 The two main types of stem cell transplants are autologous and allogenic. For an autologous transplant, your own stem cells are collected and stored for use later on. This works best when you still have enough healthy stem cells, even though you’re sick. If you have cancer, the cancer cells are removed or destroyed from the collected cells. For an allogenic transplant, you get stem cells from a donor. The donor can be a relative (like a brother or sister) or an unrelated person. You also may get stem cells from umbilical cord blood donated by an unrelated person. To prevent problems, the donor's stem cells should match yours as closely as possible. Donors and recipients are matched through a blood test called HLA tissue typing. Stem cells used in transplants are collected from donors in several ways. A procedure called apheresis (a-fer-E-sis) may be used. For this procedure, a needle is placed in the donor's arm to draw blood. Then, his or her blood is passed through a machine that removes the stem cells from the blood. The rest of the blood is returned to the donor. Stem cells may be collected directly from a donor's pelvis. This procedure isn't used very much anymore because it must be done in a hospital using local or general anesthesia (AN-es-THE-ze-a). For this procedure, a hollow needle is inserted repeatedly into the pelvis, and marrow is sucked out of the bone. Although many people may think of a transplant to mean replacing a diseased organ with another one, such as in heart or liver transplants, stem cells have an important and often life saving use for treating disease. A stem cell transplant doesn't involve surgery in the same sense as an organ transplant and the procedure is simplistic in comparison. Its benefit, however, can be just as enormous. What is a Stem Cell Transplant ? In basic terms, a stem cell transplant is the infusion of healthy cells to replace diseased or damaged ones. If successful, the healthy replacement stem cells will integrate into the body and give rise to more cells that can all take on the necessary functions for a specific tissue. There are current treatments that have shown success over the years and it is anticipated that the therapies will be further refined to improve success rates. Cancer, particularly leukaemia, is an important disease for stem cell transplants; bone and peripheral blood stem cell transplants have been used for decades. A patient receives chemotherapy or radiation treatment to destroy the cancer cells but unfortunately, healthy cells are also damaged. A stem cell transplant can replace the lost and damaged cells with fresh, functioning ones, which can then provide the red blood cells, white blood cells and platelets that are important to metabolism, clotting and immunity. The other benefit of this treatment is that the newly formed white blood cells can further improve immune function such that they destroy any remaining cancer cells in the marrow. Aplastic anaemia is a condition that is not cancerous but rather, involves a reduction in the production of blood cells by the bone marrow. A stem cell transplant can replace the dysfunctional marrow with new functioning stem cells. 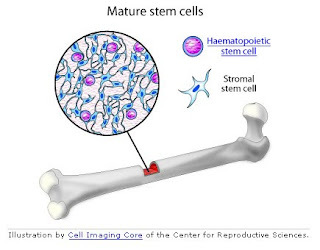 These stem cells then travel from the bloodstream to the marrow where ideally, they begin to work properly and produce healthy working blood cells. * Parkinson's disease - replacing destroyed brain cells with healthy ones. * Type I diabetes - providing viable functioning stem cells for the pancreas. * Retinal diseases - transplanting stem cells to replace those in the retina that have been damaged by disease. Thus, although some people will experience few complications, others may find they suffer from short and long-term problems associated with a stem cell transplant. The success varies widely and it is impossible to predict who will experience side effects and to what degree they will occur. In most cases, the benefits of stem cell transplants will likely outweigh the risk of complications and these techniques can truly be life-saving for conditions such as leukaemia and aplastic anaemia. It is hoped and anticipated that future research can yield successful therapies for a broader range of diseases.